New York City’s Birdland is one of the most legendary jazz clubs in the world, an intimate room where aficionados can enjoy the world’s greatest jazz artists in an up-close environment. Perhaps more than most venues, the sound system at Birdland is a vital part of the musical experience. Birdland has taken its in-house audio to new heights with a host of Harman's JBL loudspeakers, including six VRX932LAP powered Constant Curvature loudspeakers, a pair of ASB6112 subwoofers, two Control 29AV loudspeakers, and six PRX612M powered portable PA speakers used as stage monitors. 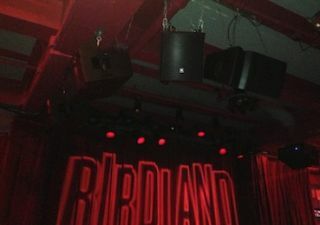 To achieve this goal, Birdland hung six JBL VRX932LAP loudspeakers directly above the stage facing the audience—two facing downstage towards the main house, two located stage right towards one side of the room and two on stage left facing the rear side of the bar. In addition, two Control 29AV loudspeakers are hung at the far side of the bar, giving total coverage for the room. The two ASB6112 subwoofers are hung downstage on the left and right front corners.